Whether you're shooting sports, weddings or wildlife, there are certain genres and situations that make carrying 2 or more fully-rigged cameras more practical than constantly stopping to swap lenses. That can make for some interesting juggling, precarious balancing and even some serious damage to you and/or your gear if the rig you're using to carry those cameras isn't correctly engineered. 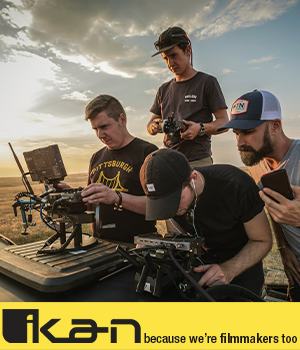 Fortunately, we know of a few that are designed and manufactured to hold your gear securely, let you access it easily and make you look good while you're doing your job. Here are our 3 favorite multiple camera rigs for your consideration. Created by a professional wedding photographer to solve the problems he experienced with other rigs. Security: HoldFast's entire product line is based on a unique clip system, designed to, well – hold your camera fast. 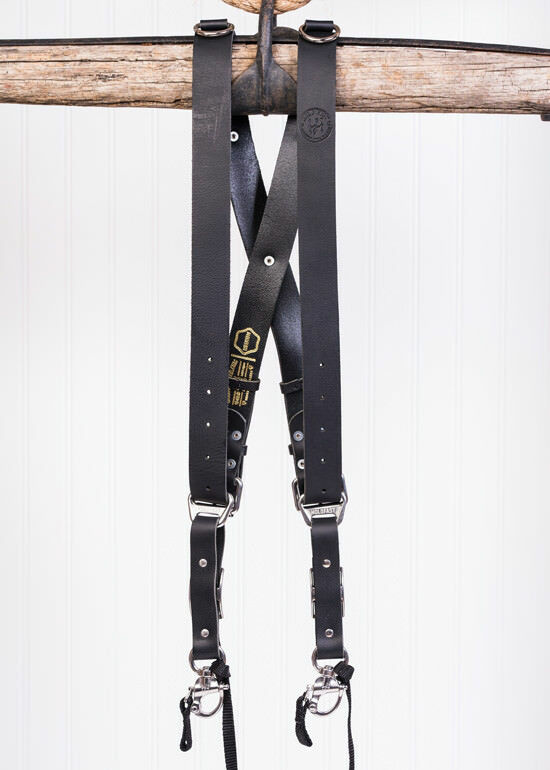 Safety straps work independently of the clip for added safety. Each harness is assembled by hand right in the middle of the Heartland, with top-quality hardware like high-grade sailboat clips. Easily attach a third camera and still have quick, easy access to all three. Incredible style: the MoneyMaker looks great even with your formal attire. You'll look classy at any event. It's extremely comfortable without all the extra bulk of foam padding. A "skinny" version is available for photographers with a lighter build. 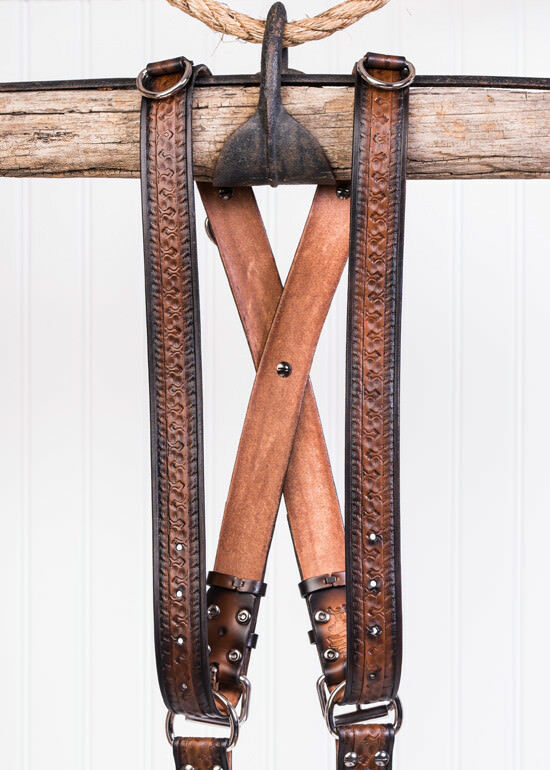 A remarkable array of materials, such as: water buffalo or American Bison leather, genuine python skin, bridle leather and even a hand-tooled and painted leather version. A company with a conscience: A non-leather model, made with high-grade nylon, was created due to popular request. All products are ethically manufactured. HoldFast creates sustainable jobs for the region. Take a look at the impressive looks and beautiful functionality of the MoneyMaker, here. We think you'll agree that it's the number one pick for the professional shooter in any setting. For photographers who prefer not to "strap themselves in", our number two pick carries 2 outfitted cameras on one shoulder sling. It's also convertible to a single-camera sling with a stability strap. It's engineered to hold your cameras in a way that lets them glide freely along the adjustable straps, throughout a range that you set with easily adjustable limiting bumpers. On the down side, it's not going to look so awesome with your tux and you're going to experience more fatigue during long shoots. It's a practical choice: Nylon straps and shoulder pad make the Yeti rugged, weatherproof and easy to clean. A patch of rubber mesh under the foam-padded shoulder helps keep it in place when you're active and sliding your cameras. The angled fasteners at the front and back of the shoulder let the straps hang naturally at your sides, without buckling or binding. The Yeti is lightweight, durable, versatile and a good choice for active photographers that need to switch between two cameras quickly and don't mind a strap with a more utilitarian look. The Yeti Slim is identical in design and function, but features slimmer straps and a narrower shoulder pad for photographers with smaller frames. If you don't need to carry a third camera, prefer the feel of a shoulder sling over a full harness and don't mind a more casual look, take a look at the Black Rapid Yeti. 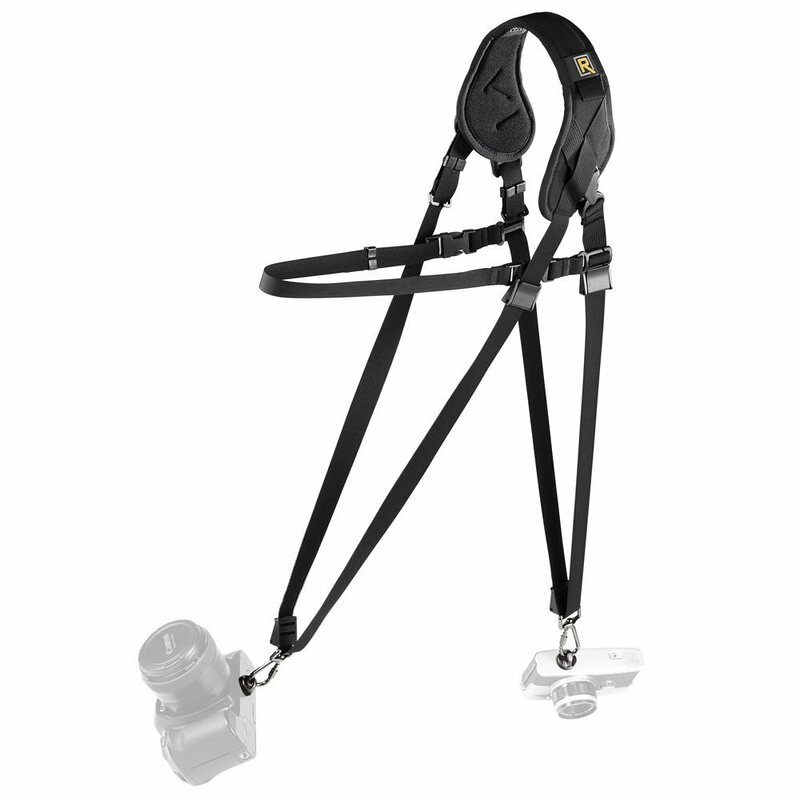 With the same lightweight, durable construction as the Yeti, our number 3 pick is a more conventional, utlitarian-styled double camera harness. 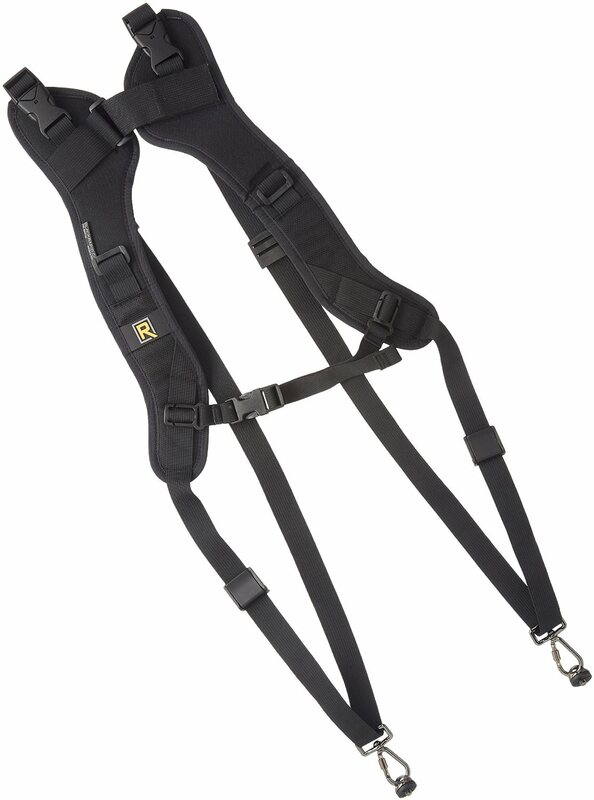 It offers plenty of padding, the same fastening and gliding systems and all the security, in a full harness design. The extra bulk and more tactical approach to styling make it less suitable for formal events. There's also no provision for a third camera. There you have it; our top 3 picks in multiple-camera carrying solutions.